Summary: Born to the pinch’s binder, Willow, Otter is even more powerful than her mother when it comes to binding the dead with knots. But when Willow rejects Otter as her successor, events conspire to place Otter in a position where she must become binder anyway. Her friends Kestral and Cricket have different roles in the pinch, but their combined knowledge helps the three unravel why the White Hands are haunting their people, and how it all began. Cricket’s openness as second storyteller gets him banished from the pinch though, and Kestral and Otter go after him hoping they are not too late to save him. On their journey they met Orca, a young man from another place, and when Otter is infected by a White Hand like her mother, she must figure out how to break the curse and save the pinch or wind up another casualty. Review: In a wrenching and engaging story, Erin Bow explores themes of grief, loss, and the grieving process. Otter is a binder by birth, holding great power to bind the dead so they will not haunt the pinch and infect others by touching them. Binders have a long history in the pinch, but over the years the separation of roles has divided the pinch’s knowledge to their detriment. When Tamarack, the first binder in the pinch, dies, Otter’s mother, Willow, feels overwhelmed by the task and becomes touched by madness as she calls back Tamarack’s spirit to help her. She becomes infected by a White Hand, and must be killed so she does not harm others. Hurt when her mother, Willow, doesn’t take her as her successor, Otter gathers knowledge about binding, the White Hands, and the history of the binders. Through her journey she figures out how to stop the dead from staying, but this realization goes against everything she has been taught. In a powerful scene she accepts her fate after being touched by a White Hand, choosing to use her certain demise to free the dead that have been bound. I love titles with double meanings and Sorrow’s Knot is especially apt as Otter and those before her use a knot by that name to bind the dead, but also because the nature of sorrow is to knot up a person’s emotions, causing them to remain where they are as they struggle to deal with their grief. Bow’s history of Mad Spider, the binder that started everything, was insightful, as it was easy to see how a young girl would miss her mother so much she would try to keep her near in whatever way possible. The instinct to hold on to those we’ve lost is relatable, and letting go of the dead is the hardest thing to be faced with. If the main theme of Sorrow’s Knot is grief, then the undercurrrent is the effect of storytelling on life. As you can probably tell from my choices for memorable quotes, the storytellers were my favourite characters. Without them, Otter never would have discovered what she needed to to right the wrongs of the past, and their imposed silence about certain stories was disturbing. It’s a great metaphor for modern writing as some stories are acceptable to write about and tell and some are not, and I love how Bow uses the storytellers to convey the ultimate importance of sharing stories again and again. I also like the concept of a story having many possible endings. 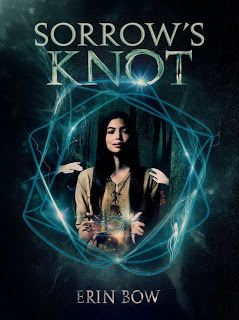 Sorrow’s Knot is a beautiful read, containing an involving fantasy adventure for younger readers, and intriguing depth for older readers. I missed reading Plain Kate by Bow, but I think I will have to remedy that when my Marathon of Books is completed. Sorrow’s Knot by Erin Bow is published by Arthur A. Levine Books, (2013).